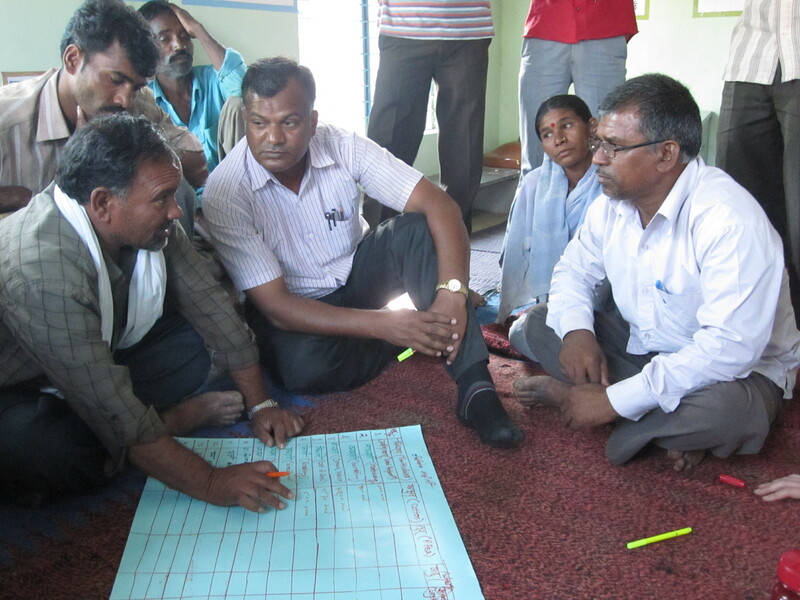 Mahendra Phate listens as villagers construct a cost-benefit analysis of their crops. As the farmers gathered into a quiet group, Mehendra Phate, our Bajaj Foundation coordinator, scratched a perfectly aligned grid onto the blue paper. Through hushed conversation the men and women calculated the input and output values of growing cotton, wheat, soybean, pigeon peas and chickpeas. Buying seeds, hoeing, insecticide, manure, fertilizer, irrigation – the list of demands grew faster than the weeds plucked from their fields. After the farmers had calculated each cost, we added them together and determined the final profit of each crop. Cotton, wheat and soybean were negative, under by thousands of rupees per acre. Astounded, we ran the numbers again, but they remained stubbornly below zero. Mr. Phate explained that while wheat and soybeans were sometimes profitable, cotton never has a positive output. We struggled to understand how the farmers could grow such cruel crops. Because of market demand and the region’s farming history, “Changing crops is like changing religion.” While the Bajaj Foundation is a successful organization, the farmers have been hurt by countless broken promises from the state government. Additionally, any investment in new crops brings more risk to their already precarious line of work. But the farmers are working to transform their livelihoods in spite of these immense challenges. Their ambition to change what is perceived as irreparable in their farming community is a brave act. I’m grateful to have had continued opportunities to work with Preshant over the last few weeks. From our very first conversation at the Bajaj Foundation headquarters early in our time here, I had asked him why he chose this work. Sometimes when English isn’t your native tongue, things spill out in beautiful, unexpected ways. He told me that he saw the struggles of the rural farmers – his own community – and that he “feels”. I knew I was in good hands when we did our biogas and grocery store visit. I was captivated by the way Preshant spoke to the crowd at the beginning of the PRA. I couldn’t understand a word he said, but I understood the feeling. Listening really is a full body experience and whatever energy and excitement in that room flowed through me as well. It was evident that Preshant was in his element after 10 years of community organizing. There are certain people in life who I know would help cure the illness that runs rampant in politics. I saw a lot of my brother in Preshant and I sometimes wonder what people like the two of them could do in our dysfunctional system. During our small group exercises, I really tried to hone my ability to listen. (I keep a list of quotes that syncs across my laptop and phone and one of them from Harriet Lerner is especially relevant here: “If we would only listen with the same passion that we feel about wanting to be heard.”) Even if you don’t speak the language, you can learn a lot from watching people speak and how the translator responds. Manasi and Preshant are really good translators for this very reason: you can glean a lot of info from their reactions. Marcy and I definitely enjoyed the session. At the beginning the group was very shy but by the end we definitely had a cast of characters. The way the women would interrupt to correct something always made laugh. The playful chiding of the young scribes illustrated the age dynamic in India and the group loved it. I was honored when Preshant told the villagers that he didn’t need to translate as much because we had listened with our hearts. The idea of public service is still so far off in my mind, but if I ever get there I hope that compliment can still hold. “The men. They do not appreciate the work that we do.” Asserted a young woman clad in a fiercely beautiful turquoise and silver sari. She sat in a circle amongst a collection of her fellow women villagers who all nodded their agreement. With a marker in had, she directed her attention to the list of twenty-seven tasks the women had compiled of daily duties. Children wandered in and out of the circle, a constant reminder of just how many responsibilities the women must juggle at any given moment. When asked what time the women begin and end their day, a resounding 4am to 10pm echoed in response. That is an eighteen-hour day. This initial assessment of the type/amount of work women do in their village was only the first exercise in the Participatory Rural Appraisal (PRA) the Bajaj Foundation conducted. The Bajaj Foundation leads PRAs with the profound understanding that the villagers not only know more about their village, but also the solutions to whatever problems the village face. 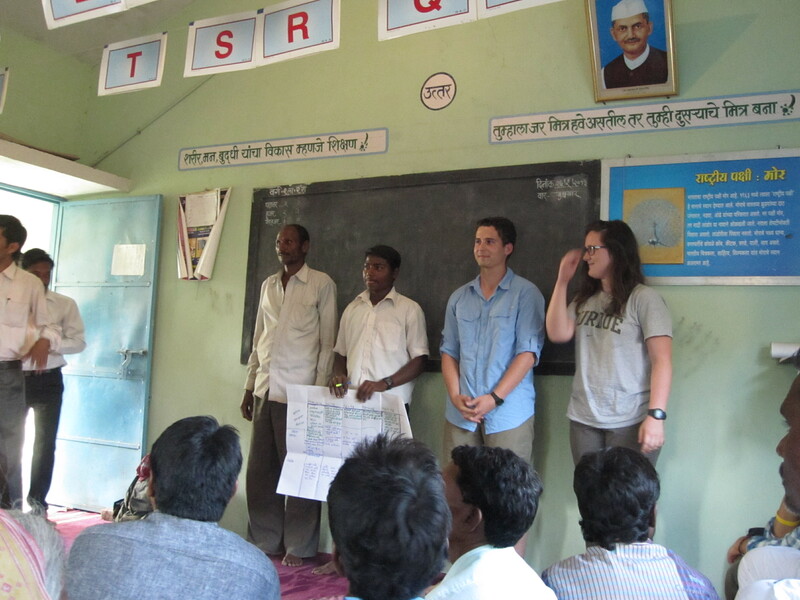 In that way, the role of the Bajaj Foundation is that of an organizer/facilitator of change. I sat in silence during the car ride home because my mind was racing. It was such an interesting day doing the PRAs. My primary thought for the rest of the night centered around one main idea. How can I be as effective at teaching/leading/being a role model? Watching Prashant and Mahendra was such an uplifting experience. It truly is an honor to work with people like them. Prashant has such charisma and knowledge and can really connect to those he works with. As I watched him lure people out of their reticence and get excited about the activities, I wondered how can I obtain those same skills and energize and motivate those around me. Observing Mahendra, I saw how he pushed the villagers enough to think through their answers and keep developing them until they had a solid idea of the concept at hand. I love giving other people the tools and skills necessary to be able to create more value in their lives or in other people’s lives. But I’m always terrified of imparting the wrong information, not being able to answer their questions, not being able to adapt to whatever the situation is or not being able to convey the information in the clearest way possible. I think the activities that the Bajaj Staff conducted during the PRA were all excellent. They were not overwhelming the villagers with too much information. The Bajaj Staff gave them the power of sharing their information. Each of the activities were very useful at conveying a lesson or a message. It was so awesome to see the whole PRA come together in that way. We sat in the entryway to the school, and by the time we finished our conversation the sun had moved from our laps to cover the wall of the school with the diamond pattern of the wrought iron window. We had been talking with a group of farmers about the history of their village, Pargothan, located in the Arvi block of Wardha. We divided a large sheet of paper into five ten-year blocks, and we learned that from 1963 to 1973, outbreaks of typhoid and cholera had spread through the town. Within the next ten years, what is still the nearest hospital to Pargothan was built in another Arvi village 50 kilometers away. Between 1983 and 1993, the government introduced hybrid versions of cotton and soybean crops, and since then knowledge of indigenous plant species and how to cultivate them went unused and was forgotten. Today, all of the crops grown in Pargothan are hybrid varieties. At one point, a man carrying a young child began to observe our conversation. Between making contributions to the timeline, different group members took turns entertaining the little girl, smiling and gesturing to her. Maybe some day they’ll be telling her the history that they told us. I was really impressed by our experience with the participatory rural appraisal. While I knew all along that it was something unique that the Bajaj foundation does It didn’t really hit me until we were there witnessing it. From the moment we arrived it was amazing to watch the Bajaj Staff connect to the people in the village and get them excited. Then we broke into groups , where we got to witness everyone sharing their thoughts. What our group did was all the women listed their daily activities. I was amazed by the women and their list of 38 meaningful things they do every day. Then they listed some of the challenges they and their community face. All of the women collaborated to form this list of things they want to see change. They assigned each challenge a number based on how detrimental the challenge is to their lives as a way of ranking all of the difficulties they face. After our small groups we got back together into one big group. I was in awe of how these activities really created a sense of community and a hope for a better future. It amazed me even more that this excitement and hope was not imposed by the bajaj staff but created by the members of the community. Moving slowly against the backdrop of sunlight in the doorway, I could see villages peering in. Their tall thin forms waved back and forth like the tall grasses of their farms as the shuffled into the green school room. I tried to gage what they must have been feeling, but their faces seemed impossible to read. Once map making was finished, our Bajaj staff member went on to other tasks, leaving us alone together. Manasi asked if anyone in our group (comprised of mainly boys my age) had any questions that they wanted to ask. The discussion that developed was less of a Q&A session, and more of a general discussion about inequality. They routinely mentioned what a rich country America was, and that India was not rich. There seemed to be a general sense that most things in America were better, and many expressed a desire to go there. I told them that although America had a lot of money, it struggled just like India with severe inequality. This came as a shock. Somewhere, somehow, they had been sold a narrative that Americans had moved beyond inequality. Everyone in America was assumed to be rich. I told them that millions of people in America struggled with food and debt, just like farmers. And we had a fruitful conversation that led to the conclusion that money cannot change the problems being faced in India or America. There has to be a change in philosophy. The conversation cooled, as they wobble their heads back and forth smiling. And the sea of perfect straight white teeth, with just enough money for toothpaste but too little for routine access to refined sugar sparked a thought. I told them that they all had amazing teeth-movie star teeth- and that most people in America had to pay thousands of dollars for teeth as nice as theirs. They seemed most entertained by this, and smiled a lot more after that. During our stay in Wardha, I noticed how the work of the Bajaj Foundation (KJBF) is efficient and of important value to their beneficiaries in many ways. What distinguishes their activities is that the staffs are in continuous contact with the beneficiary either through consultation, trainings, assistance or financial help and planning. Last week we learned about another approach that adds more to the efficiency and effectiveness of the KJBF existing work. This approach is called the PRA. PRA stands for Participatory Rural Appraisal and it is about engaging the villagers to appreciate their own lives, to recognize their own problems, and to identify some possible solutions to tackle them. The way these activities are run and set is outstanding and well organized. 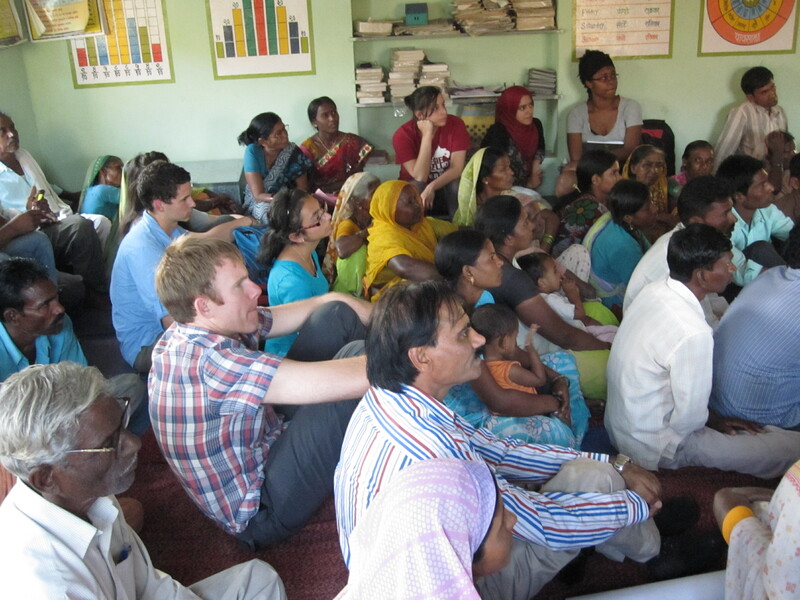 The number of the village leaders was about 60 or 70 in total composed of both genders. So, in order to make the discussions more beneficial and to meet the activities scheduled for that day, KJBF staff divided them into 5 to 6 groups most of which were composed of both genders and two were composed of just women or men. The activities lasted for about 2 hours and included interesting discussions exchanged between each group members. The activities were about telling stories about the leaders’ villages, about the daily life of these leaders and about talking about some problems related to their own jobs and life. The group I stayed with was composed of many women of different ages and they were all married. The first activity they had to finish was to state all the tasks they do on daily basis. The second one was about stating all the problems they face every day. All members in the group were energetic and participated in the discussions and brought in different thoughts and ideas. When Mr Pawar explained to me their tasks and the problems they face I realized that these women were very powerful and strong indeed. Everyday they had to finish 25 tough tasks, they had to walk for 4 to 5 kilometers, they had to feed their families and they had to work in the field. When I compared these activities with my own, I praised these women even more and admired their determination to lead a better life in their families despite all the difficulties and problems they face.